Beware: This is LONG post. One of the projects I started work on back in the frigid months of early 2014 (and finally finished February 2017!) is a restoration-type project. Before I get much further, I want to specify that I am not a trained textile conservator. I have not taken the many required chemistry classes that accompany a degree in conservation. Hence, this is not a conservation-type project. I have, however, spent a number of years trying to fix the much-loved, worn-out things that I can. I have patched and mended jeans and skirts and shirts and old dresses, and altered newer dresses so the owner can wear them again. I have stitched up teddy bears and stuffed cows and rabbits, and repaired many a broken truck or action figure. I am, slowly, learning the correct way to darn socks and other worn-out, knitted items. I have even patched a quilt or two in my time. So, when Robert’s friend Sheba asked if I might be able to fix her quilt, I said I’d take a look. And I was a little scared. This was, quite honestly, the largest restoration project I’ve worked on. I’ve had to fill in some replacement quilting stitches from where they’ve come loose before, and had to fix tears and patch holes, and I’ve completely replaced smaller sections of a quilt before (Mom had, thankfully, saved the red flannel fabric left over from the original construction, so it was just a matter of cutting a replacement piece and carefully stitching it back in. This one, however, tested all of my skills. A number of the squares had pieces of fabric that were starting to fray, as the seam allowance has worn away over time, or the fabric had shrunk in the wash and pulled at the original stitching. It’s a common enough problem. Textiles are fickle things, and they break down over time. It’s just the nature of the beast. However, it’s a whole other level of challenge when you add in textiles of different weave, strength, and fiber content. Some of the pieces look to be woven cotton prints, others to be knits – possibly polyester, but I’m betting on rayon blends, due to the way they shift and feel. Each of these kinds of materials have their own tactile quality (or “hand,” in textile speak), and this translates to specific pros and cons. This is one of the things you learn fairly early on, when working with different fabrics – some look beautiful, but are the very devil to work with. Like velvet, and it’s stupid tendency to hold on to itself while sewing (though, sometimes that can be a blessing). Or trying to work with a fabric with a fair amount of Lycra in it. Or anything described as “lamé.” Seriously, the next time someone asks me to sew lamé, I’m going to throw a pressing ham in their face. So, fabric is a jerk sometimes, but as long as you understand the special character of what you’re working with, you should be okay. Unless, of course, you are working with several different kinds of fabric, all with their own quirks, all in the same project. And you have no definite idea about what they are. That’s where things start to get a little difficult. With some of the blocks, I was pretty sure I could just unpick the stitches, turn a little more fabric under, and use an applique stitch to reapply it to the quilt. There were a few places, however, where I could tell that the fabric had pulled too much and needed to be replaced. Obviously, I don’t have any extra pieces of the original fabric sitting around, so I had to do my best to do some creative matching and piecing using some of the pieces in my stash. Thankfully, I found a nice little collection of vintage cotton prints while going through boxes in the storeroom last year. In addition to the quilt, there was a small throw pillow that needed a little TLC, as well. I figured it was as good a place to start as any. It has the same pattern as the other quilt blocks, was in a slightly better condition, and would give me an opportunity to gauge the fragility of some of the materials. It was missing a small piece (the handle of the umbrella), so I used a small piece from my stash, inserting it while I had some of the original stitches picked out. I had to turn in a little more of the seam allowance on the skirt, so it’s not as round as it originally was, but I think it’s close enough to the original look to fit in with the rest of the quilt. After all of the pieces were reattached to the main block of fabric, it was just a matter of stitching the front and back pieces back together, re-stuffing the pillowcase with an actual pillow form, instead of the quilt batting that had originally been used as the pillow stuffing, and slip-stitching the opening back together. Voila! A repaired appliqued pillow case! Now, it was on to the rest of the quilt restoration! The quilt is made up of 9 appliqued blocks, with sashing filling the space between each block and around the edge. Because it’s always good to know which section you’re talking/thinking about (and because I have a background in history and a love of archaeology and archival collections), I assigned each square a letter and a number, corresponding to where they fall on the quilt. The top row of blocks is A, the second B, the third C. The first column is 1, the middle is 2, and the right hand column is 3. Simple enough to follow. As I mentioned, the pillowcase was in slightly better condition than some of the other blocks on the original quilt. There was one square of the quilt in particular – C2 – that was in rather rough shape. Most of it had torn away from the seams around the block, with a four inch tear eating in towards the middle of the block, skirting the edge of the parasol applique piece. There were two approaches I could have taken to fix this square. I could either carefully cut the fabric around the applique, leaving a seam allowance that I could then turn under and stitch on to a replacement block piece. Or, I could take out the block altogether, carefully remove each piece, reapply them to a new backing in the same pattern, and then sew the whole thing back in to the original space. Perhaps the first method would have been a little easier. I’ll never know, because I went with the second option. The main reason I decided to do this method was the major damage that had already been done to the original backing. The four inch tear was pretty substantial, and had weakened the integrity of some of the rest of the backing. Plus, I also knew that I was going to have to fix some of the edges anyway, where the original seam allowances had frayed and started to come away from the quilt block. First, I had to remove the quilting stitches that held the entire quilt sandwich together. These stitches included machine sewn lines around the block (that weren’t always of a uniform length and were, often, quite small), as well as some hand-sewn back-stitching that, I think, was part of an attempt to save the quilt from further shifting and damage. After an hour of careful picking, I had undone all the quilting stitches. Next, I had to remove the quilt square itself from the sashing. The base of the appliqued square was very worn and torn in places, as it had shifted and pulled over time. In order to transfer the applique to a new piece and stabilize that section of the quilt, the whole block needed to come out and be replaced. I carefully removed the seams, all around the block, and then handed the square off to Robert. I had a stash of linens and cottons that might work for a replacement supporting material, and I set him the task of figuring out which one matched the best, as I set about carefully picking out stitches on the quilt. While he cut out the square – making sure to add a few extra inches all the way around, to allow for some leeway when placing the new piece back into the quilt – I moved on to the next step: removing the old batting from the same section of the quilt. 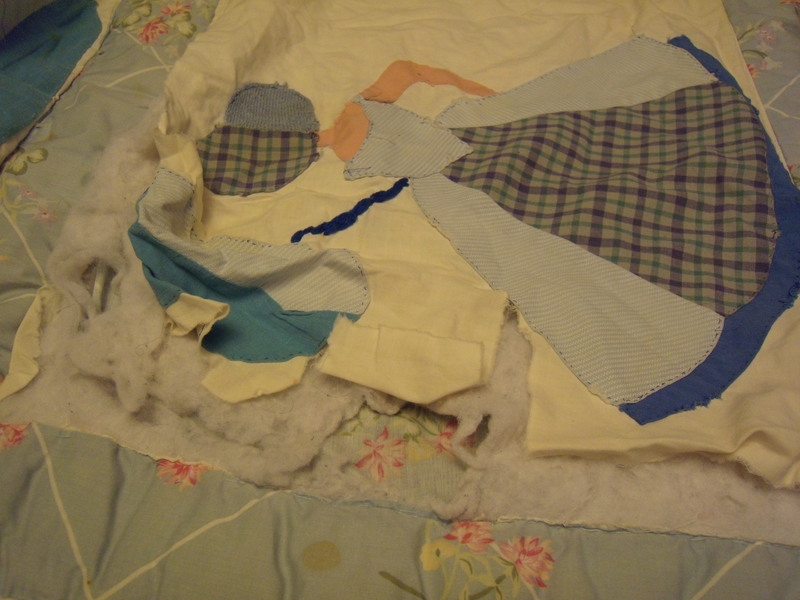 Because a large portion of the top layer of the quilt had been torn away, it left the normally sheltered batting open to greater wear and tear. The batting was rather thin in several places, and had several holes in it, so I went ahead and removed it. After the batting was cut away, I had to fill the space with a replacement. This is why it’s important to not throw away the pieces of a restoration project until the very end. When I had taken apart the seams in the pillowcase, I found that there wasn’t a regular pillow form inside. Instead, the original quilter had used leftover batting from the quilt to fill the pillowcase. Pretty ingenious use of extra materials, and a good thing for me when I needed to find the right kind of batting for the empty section of the quilt. Since pillow filling had been made out of leftover pieces from the original quilt, that meant the batting was the same age, type, and thickness of the batting I’d had to remove. Unfortunately, none of the extra pieces of batting were quite big enough to completely fill the needed spot. I was expecting that (though hoping otherwise), and planned accordingly. Occasionally, when you work on a quilted project, you’ll find that you have to join two or more pieces of batting together. Sometimes it’s because the project is bigger than any regular size of prepackaged batting you buy at the store; sometimes it’s because the project is an odd shape. I’ve had to join batting before, so I wasn’t too worried. I cut out a piece that was almost big enough to cover the empty spot, and began whip-stitching it to the edges of the batting that fell under the sashing part of the quilt. When the large section was secured, I simply cut another, smaller strip of batting and whip-stitched that to the bottom of the not-quite-big-enough batting. I went ahead and pinned the bottom edge to the bottom of the quilt backing, so that the batting wouldn’t shift while I worked on the quilt square. Pinning the petticoat piece into place. With the new-ish batting in place, it was time to rebuild the quilt block. 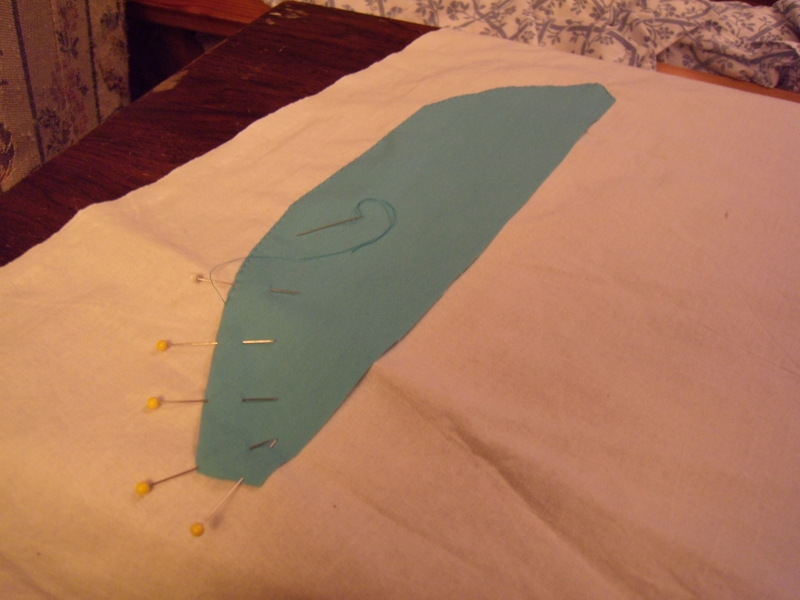 First, I started to pick out the stitches running along the bottom edge of the bodice piece and around the skirt. This piece also had a thin petticoat piece that would be attached under the bottom edge of the skirt. Sadly, the piece was in rather rough condition, so I cut a replacement piece out of some blue fabric that I had and started to apply it to the new square backing. I adjusted the seam allowance all the way around the skirt and stitched it down, using a running stitch. That’s how most of the pieces are actually attached to the quilt, but as I worked I started second-guessing using it. While I wanted to stay as close to the original material as possible, I felt a blind hem (or blind applique stitch) might actually help the quilt fray less. It seems to me that the running stitch allows for more wear along the (admittedly) small, loose edge of each piece, whereas the blind hem stitch seems to hold the edge of the appliqued fabric closer to the backing fabric, leaving less room for wear. At any rate, I went ahead and attached the rest of the pieces with a blind hem stitch. 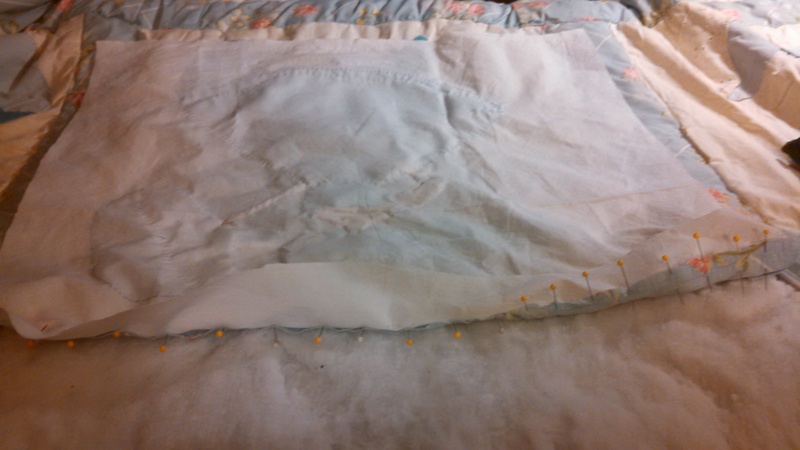 Finished reconstruction – with a new bodice piece. under just a little, and still use them, but the bodice piece would have been made too small with a larger seam allowance, so I cut another replacement patch from my stash of similar fabrics and stitched it in. I saved the bodice piece, hoping I would be able to use it when I had to replace one of the pieces on the bonnet, but it wasn’t quite the right size or shape, so I set it aside. The big question came when it was time to figure out how to make the parasol handle. With the pillowcase, I had just cut a totally new piece, because the original pattern was missing a handle. On this square, though, the original handle had been made with some blue yarn, sewn directly onto the quilt square backing. I debated pulling out the original stitches and resewing the handle onto the new applique backing, but I was worried about pulling the fabric and making a hole that might destabilize the new piece, so I opted for carefully cutting out the original handle, turning over a 1/4 ” seam allowance, and applying it to the new backing, just as I was doing with the other pieces. With everything transferred over to the new quilt square, it was time to stitch the block back into place. Using the edges of the original piece as a guide, I marked off the size of the opening, and left at least an inch of space on each side. I pinned the top edge of the block to the top side of the sashing, right sides together, and hand stitched the block and sashing together. Then, I pinned the sides and bottom of the block to the rest of the sashing, being careful to fold the sashing a little more, to make sure there was a 1/2″ seam allowance. Since the positioning of the quilt, and the fact that I hadn’t taken out all the quilting stitches in the surrounding area, meant I couldn’t sew the block to the sashing the same way as I had along the top, I finished joining the pieces with some more blind hem stitches. Additional quilting stitches around the block will help to stabilize these seams, and keep too much pressure from being put on the blind hem stitches. Voila! The first rebuilt panel was now back in place! Now, I had done a quick once-over of the quilt before starting work on the above quilt square, but I hadn’t gone too in depth with my evaluation of each piece, as I felt it was more important to fix the heavily damaged square as soon as possible, before it was damaged any further. I knew there were a couple of other places where the seams were starting to wear, and there were a few holes that needed to be darned, but I didn’t think there were any other places where the blocks had torn away. A minute into a more in-depth analysis of the quilt showed that squares B2 and B3 had also begun tearing away at the seams. Neither one was in quite as bad shape as C2 had been. Looking at B3, I realized that it was the easier fix. The block was actually bigger than the space it was sewn into, so all I had to do was unpick three of the seams, adjust the block, and stitch it back down. B2 was a little more worse for wear (though, again, not as bad as C2). There was a one inch hole near the corner of the block, and the seams on both the top and left hand side of that same corner had started to tear. I was wondering if I could reliably patch the block with another piece of linen, when I realized that this block, like B3, also had a little room to play with. I carefully picked out the stitches along the top and left hand side of the block, as well as about an inch along the bottom corner. While I had the backing fabric free, I took advantage of the opportunity to fix the applique on the square. That, incidentally, is the main issue with most of the blocks – it’s mostly fixing the appliqued pieces. Some of the fabric has started to disintegrate (again, that’s the nature of some textiles) and some of it has just become unattached from years of wear on the stitches. It’s not necessarily hard work, but it can be time-consuming. Thankfully, all of the applique pieces were in good enough condition that I didn’t have to replace any. A little turning of the edges and stitching them back down was all I needed to do in this case. Once the pieces were all secured, I repositioned the edge of the block and stitched the sashing back down. I did much the same for B3, with the addition of having to replace a few pieces. The arm piece had really come apart, so I needed to create a new one. Luckily, one of the fabrics I had pulled out of my stash matched the fabric on the shoulder piece, and the repair didn’t stick out. I moved on to working on C3. The backing fabric of the panel was in good condition, but many sections of the applique were in need of restitching. I carefully removed all the pieces from the backing and restitched them, without removing the backing fabric from its “frame” on the quilt. I then moved my attention to panel C1, thinking I would finish up the work on the quilt from the bottom up. Like panel C3, this panel required the removal/re-stitching of the applique pieces, as well as some repair work to some of the seams and a complete replacement of the bodice piece. Unfortunately, when I began removing the stitches, I noticed a few additional problems. The backing fabric for the panel had been made by sewing two pieces of fabric together. Unfortunately, there was a large tear in the seam. It was not immediately visible, as it was hidden underneath the applique. When the applique was removed, the hole was revealed. Unfortunately, the tear in the fabric requires a complete replacement. There is not enough of the original material to sew up the tear and allow for a large enough seam allowance around the edge of the panel. As I removed the panel for reconstruction, I noticed that the original batting was almost entirely gone. Unlike the C2, this was not wear caused by exposure, but wear which occurred completely encased within the quilt top and bottom. At this point, I hit a little bit of despair. I had originally planned to replace as little as possible of the quilt. Not because I didn’t want to do the work…but because I wanted to preserve as much of the original look and feel of the quilt as possible. I didn’t want to hand back a quilt that looked completely different than the one I had originally started work on. This meant I was trying to keep the same look and eccentricities of construction as possible, only adding stitches to make the applique and quilting more secure, and replacing pieces only when I had to. As I removed the C1, however, it was clear that I was going to need to amend my original plan. This was confirmed when I started removing the quilting stitches at the top of C1/bottom of B1 and found that those sections of the panels had never been stitched to the sashing during the piecing stage. Instead, they had been attached at the time of quilting, and were only held in place with the quilting stitches. And so, I started the process of unpicking ALL of the stitches on the quilt. Not just the quilting stitches, or the stitches holding the panels I’ve not yet worked on to the sashing. All of the stitches. Including the pieces I’ve restitched into their place already. Since I need to completely replace ALL of the batting in the quilt now, that means I need to completely remove the quilt top from the backing fabric. ::Sigh:: At least this should make some of the repairs to the backing fabric a little easier (yes, there’s even a section on the quilt back, which is pieced, that needs to be re-sewn). Friday night saw me carefully labeling each panel square with a little fabric tag (pinned to the front of each skirt piece), in preparation for the monumental task of removing all of the quilting, instead of just strategic areas. Once everything was labeled with fabric scraps, I began the tedious process of separating the quilt top from the bottom, and breaking down the pieces into piles of applique squares and the sashing. It took two days worth of work to get most of the quilt apart – even then, I left some of the sashing around a square or two, in order to get to work salvaging the remaining applique squares. With the batting removed, the new applique stitches on C3 were a little too loose (the stitches had caught some of the batting while I worked, and I had carefully pulled the disintegrating batting away). I pulled the stitches a little tighter and restitched in one or two places, making sure the pieces were once again secure. With that, I completed a full line of squares! All of the C row squares have been fixed. With this little ray of sunshine smiling on me, I moved on to some of the other panels. I started on one of the A panel squares first, as one of the pieces was falling off of the backing material. Realizing I was only one square away from having another whole row fixed, I went back and worked on square B1. B2 and B3 had been the second and third squares I had worked on, so it felt right to complete that row before going back to finish the other A squares. Again, I tried to keep most of the original materials in the same square, only replacing when I felt I couldn’t save a piece. However, in the interest of maintaining the integrity of each piece, I do, occasionally, have to re-size a piece. This mostly just means the seam allowance under the applique edge is almost gone, and I need a little more to work with. Unfortunately, this also means that the re-applied pieces tend to take up a slightly different footprint than the original square. Hopefully, this won’t be too obvious once everything is put back together and the quilt undergoes a thorough cleaning, to even out the wear and discoloration. Fast forward a couple weeks – all of the sashing had been taken apart, ironed, and placed to the side for later re-assembly. Almost all of the blocks had been rebuilt, and I was down to just one more square. A3. The backing was in pretty good condition, as were the skirt and bonnet applique pieces. However, the bodice piece and the parasol were in pretty rough shape. I cut a new bodice piece, extending the bottom edge to make it slightly bigger than the original piece. I had hoped there was enough of a least one of the parasol pieces to salvage and reuse, but they had frayed quite a bit and I had to cut two new pieces. I think they ended up looking okay, though. Thankfully, most of the fabric I used appears to fit well with the original color scheme of the quilt. In fact, the fabric I used to replace some of the arm/neck pieces was an exact match! The next step was to evaluate the backing fabric. While the fabric wasn’t as badly damaged as some of the front blocks were, there were places here and there where the fabric had torn, or spots where tiny holes had worn through. There was also the little matter of the fact that part of the backing wasn’t really sewn together. Instead, it had been held in place by the quilting around the blocks. While most of the blocks (the backing is pieced, as well) had generous seam allowances, there were a few edges where the allowance was just barely a quarter inch. Since this quilt obviously sees a lot of use and love, I wanted to shift some of the seams, to allow for a stronger backing piece. So…I grabbed the seam ripper again – by now we’re good friends – and set to work separating out the different pieces. I started with the first “column,” being careful not to disturb a piece appliqued to the back, representing the ASL sign for “I love you.” I trimmed a little bit of the old batting away from this section, again careful not to pull or damage the original stitching (the creator of the quilt stitched her initials on the back, below the appliqued piece. I went back around the applique, reinforcing the stitching and tucking the thin seam allowance back under, and then ironed everything, altering the seam allowances just a bit. Once I had separated the backing blocks and ironed them flat again, I repaired the small tears and holes. Then, the blocks got stitched back into columns, and the columns stitched back together into one big whole. At long last, all of the squares were complete, the backing was repaired, and I could begin the process of reassembling everything. I started with re-stuffing the pillowcase. Since that was the first piece I had started work on, all that time ago, it seemed right to complete it before I did anything else. I bought a new form – remember, the original pillow form had been made out of scraps of batting, and they had shrunk and stretched over the years. It took some work getting the new pillow form inside the rebuilt pillow case, but I managed to do it. Then, I stitched up the hole on one side, and VOILA! A finished pillow. Next came the task of laying all of the panels out and figuring out how the sashing should go back together. Usually, the sashing is cut in even widths and lengths and is inserted in horizontal, then vertical order (or vice versa). However, the original sashing was sewn on in a sort of quilt as you go fashion. Taking all of the panels apart for the repair meant that the sashing wasn’t going to be the same as it originally had. So I took each of the ironed sashing pieces, and began the process of laying them out alongside each of the panels, puzzling out where each would fit best. When I had the sashing set out, it was a (relatively) simple matter to stitch the vertical pieces between the blocks of each row together, stitch the horizontal sashing pieces together along their short edge, and then assemble the panel and sashing rows. Of course, in the middle of sewing the pieces together, I managed to turn one of the panels around and stitch two rows together in a way that one of them was upside down…which meant sitting down and grumbling about my not paying attention while I carefully unpicked a rather long seam. The stitching was pulled out, the panel flipped the right way around, and everything went together fine after that. I did have to get a little creative with two of the corners. Because none of the sashing is cut to the same length, determining which side was going to be longest took some guesswork, and I got it a little off two times. But this wasn’t really a problem. I just went back and stitched the extra length on one side to the edge of the other sashing panel. At long last! I had a finished, repaired quilt top, and a repaired quilt backing to work with! Then came another difficult decision…did I clean the quilt top before basting everything together, or after everything was assembled and the raw edges of the quilt were bound? I don’t think there is any one real “correct” answer. I think one’s decision either way largely depends on the condition of the restored quilt, the type of material, and whether you can clean it easily without damaging the raw edges. In the end, I decided to assemble the layers, quilt around each block, and finish the edges before subjecting the quilt to a thorough cleaning. I was mainly worried about affecting the raw edges of the quilt top, if I washed it before everything was back together. Basting everything together had to wait until I had space to set everything out. While I had laid things on the carpet at home, in order to determine layout when piecing the top back together, I needed to lift the quilt up to at least thigh height in order to baste or pin it correctly. This meant waiting until the renovation of the fellowship hall at church was finished, so I could go back in and use the large tables. Mom accompanied me to the church, where we laid out each layer and went to work. Usually, I will pin all three layers together with straight quilting pins, and we’ll go back over the whole thing with our basting needles and thread. Of course, even with smaller quilts, that takes a LOT of time, and I inevitably stab myself with pins or drop them on the floor, or they fall out before I’m finished basting. This time I decided to take a different route. I had a bunch of quilting safety pins that came from a generous sewing room donation from a friend. Since I was planning to use my machine to do a stitch-in-the-ditch grid, I thought the safety pins would be a better option. They would hold the layers in place without falling out. Even without using needle and thread to baste everything, the whole process still took over an hour to do – and that’s with two of us working! Just further proof, in case you needed it, of the amount of work that goes into making a quilt. Of course, part of that time was related to the unique challenge of this top in particular. Because the pieces were cut by eye, rather than using a template (and because, wanting to keep to the aesthetics of the original design, I didn’t measure and cut them down to exact size before piecing them together) the whole top is a little uneven. It is basically a square, but some edges are a little wider than others, and the blocks do not form an exact grid. This meant we would pin the layers, stare at the quilt with our head cocked to the side, re-pin it, stare at it again, and then fix the pins again. Even then, the edges did not completely meet up — meaning I would have to do some quick thinking when it came time to do the binding, but I set that thought aside for the moment. The first step of machine stitching was completed that night, following the lines of the sashing. That couldn’t be the only stitching, though. Each block is roughly 15″x15″ (one or two have slightly smaller dimensions), which means you have a pretty sizable amount of loose fabric between some of the stitching lines. This is what caused many of the tears in the first place. Quilts get put under a lot of stress – they get caught under heavy things and tugged free, they get wrapped around bodies tossing and turning in their sleep, they go through the wash (and not on a delicate cycle)…all of these things put the fabric under tension. The more quilting stitches there are, and the closer together they are, the more this tension gets distributed across the wider area. When the quilting is spaced out, though, say…across a 15″x15″ block, the weight of the quilt pulls at only a few seams, putting stress on a very focused area. It’s only a matter of time before the fabric strains so much that it starts to tear. Now, different types of quilt batting have different recommendations for quilting stitch density. This could be anywhere between 2″ intervals, up to 8 or 10″. These recommendations are printed on the bag that the batting comes in (or printed on the dimension tag, if you’re purchasing your batting off the roll). Personally, I don’t like leaving a huge space between stitches, even when the batting tells me I can. I just figure it’s safer for the life of the quilt if the stitching intervals are no more than 5″ (and even that is pushing it on some quilts). Plus, stitching closer together allows for that “puckered” look a quilt gets when it’s run through the wash the first time. 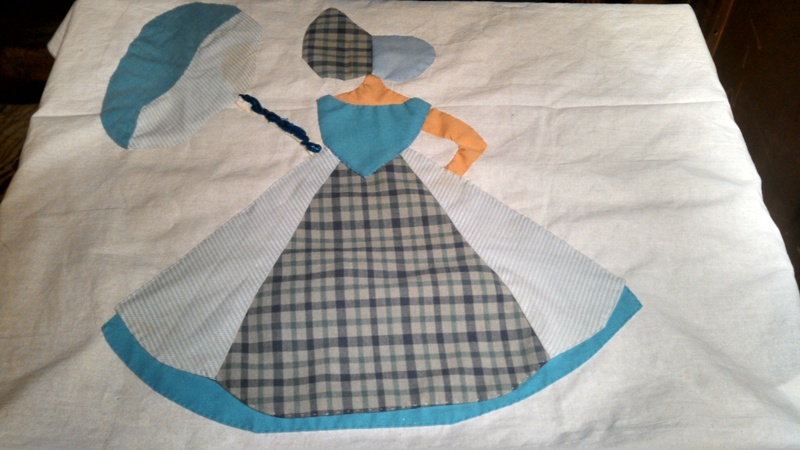 Since I didn’t want to leave that great expanse of a quilt block un-quilted (as it would mean the quilt would need to be repaired again sooner rather than later), I went ahead and hand quilted around each of the sun-bonnet ladies and their parasols. This should secure the center of each quilt square, not only putting less stress on the backing and batting, but also on the applique itself. 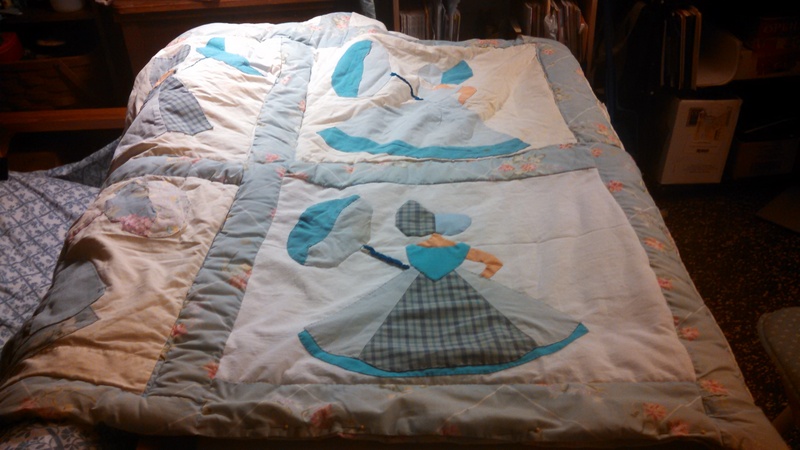 Even though the original quilt hadn’t utilized that kind of quilting around each piece (that would have added even more hours to the time spent unpicking all the stitches), the quilt still had the same basic look to it. As I stared at it, though, I decided to go a few steps further and quilt some channels in the white space of each block. I wanted to make sure the life of this quilt was extended as long as possible, and the added quilting – though not an original feature – would keep everything together even better. With the quilting finished, I turned my attention to the binding. I considered stitching on a completely separate binding, made of a different fabric – white muslin, or blanket binding, or something of the like. It would make doing the binding easier, and could be easily replaced down the line, as it became worn out, if the owner so desired. Unfortunately, it would drastically change the look of the quilt, not to mention require some serious trimming of the fabric. I did not want to cut of and throw away any of the original fabric, so I did a turned edge binding, performing some jiggery-pokery on one side, where the backing fabric was actually shorter than the sashing on the front. With the edges bound and the layers safely quilted together, it was time to move on to the final step…cleaning. You would think that cleaning a quilt would be a simple matter, as easy as tossing it in the washing machine. You would be wrong. Ask a group of quilters about cleaning a quilt and chances are you will get a variety of opinions and recommendations. Some people do put their quilts in the machine (I often throw the ones I made for myself in there when they need a good wash)…though most will also tell you it’s a good idea to run the machine on the gentle cycle and not to use harsh detergents. The average washing machine is pretty rough on textiles, especially quilts. Using a gentle cycle and something like Woolite can help protect colors and extend the life of a much beloved quilt. What you shouldn’t do is stick them in the dryer (again, I have been guilty of this). The heat from the dryer, as well as the tumbling, just adds to the amount of abuse heaped on the quilt. Of course, some would argue that this abuse is part and parcel of a quilt’s existence. Since this was not one of my quilts, and the fabric had already seen its share of wear and tear, I decided to err on the side of caution when it came time to wash the quilt. I did a pre-treat on several places with Grandma’s Secret Spot Remover Laundry Spray (no, I haven’t been paid to advertise them – I just happened to use a very specific item), and then washed the quilt on delicate with some Woolite. The wash helped to even out some of the discoloration on the backing. I ran it through a second wash (again, on delicate), this time using a smidge of regular laundry detergent, and spread it out across my work space to dry. I still think the quilt could use another wash – or maybe a trip to the dry cleaners – but it is finally ready to go back to the original owner. I am so upset that it took so long to get this whole thing finished, but I try to keep reminding myself how much work went into getting this thing back into a usable condition. 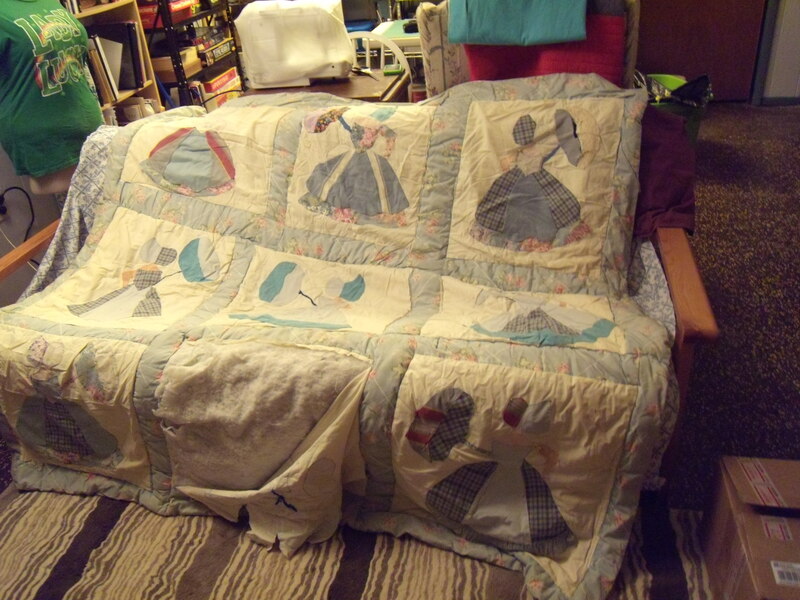 It looks a bit different from when I first got it, with new pieces added in and some of the original eccentricities gone, but I hope that the few changes mean that the owner gets many more years of love out of their quilt. Wow what a fascinating story. Thanks for sharing!